Abdallah, A. S. H., Yoshino, H., Goto, T., Enteria, N., Radwan, M. M., & Eid, M. A. (2013). Integration of evaporative cooling technique with solar chimney to improve indoor thermal environment in the New Assiut City, Egypt. International Journal of Energy and Environmental Engineering, 4(1), 1-15. Abu Khadra, A., & Chalfoun, N. (2014). Development of an integrated passive cooling façade technology for office buildings in hot arid regions. WIT Transactions on Ecology and the Environment, 190 VOLUME 1, 521-534. Ala-Juusela, M. e. (2003). LowEx guidebook: low-exergy systems for heating and cooling of buildings. Guidebook to IEA ECBCS annex 37. Birmingham, UK: ECBCS Bookshop. Amos-Abanyie, S., Akuffo, F. O., & Kutin-Sanwu, V. (2011). Parametric study of effect of thermal mass, window size and night-time ventilation on peak indoor temperature in the warm-humid climate of Ghana. Paper presented at the 7th International Symposium on Heating, Ventilating and Air Conditioning - Proceedings of ISHVAC 2011. Arenas, A., Palacios, R., Rodriguez-Pecharroman, R., & Pagola, F. (2008). Full-size prototype of active thermal windows based on thermoelectricity. Paper presented at the ECT2008 - 6th European Conference on Thermoelectrics, Paris, France. ASHRAE. (2010). ANSI/ASHRAE Standard 55-2010. Atlanta, USA: ASHRAE. ASHRAE. (2011). Advanced Energy Design Guide for Small to Medium Office Buildings. Atlanta, USA. Avesani, S. (2016). Design of a solar façade solution with an integrated sorption collector for the systemic retrofit of the existing office buildings. (Doctoral thesis), Leopold-Franzens-Universität Innsbruck, Innsbruck, Austria. Avesani, S., Hallstrom, O., & Fuldner, G. (2014). Integration of sorption collector in office curtain wall: Simulation based comparison of different system configurations. Paper presented at the Eurosun 2014, Aix-les-Bains, France. Azcarate-Aguerre, J., Klein, T., & den Heijer, A. (2016). A business-oriented roadmap towards the implementation of circular integrated facades: Merging the interests of suply and demand stakeholders in the construction industry through long-term collaboration models. Paper presented at the 9th International Conference Improving Energy Efficiency in Commercial Buildings and Smart Communities, Frankfurt, Germany. Bakker, E. J., & de Boer, R. (2010). Development of a new 2,5kW adsorption chiller for heat driven cooling. The Netherlands: ECN. Baldwin, C. Y., & Clark, K. B. (2004). Modularity in the Design of Complex Engineering Systems: Division of Research, Harvard Business School. Banham, R. (2013). The Architecture of the Well-Tempered Environment: Elsevier Science. BBVA. (2016). Emerging and Growth Leading Economies (EAGLEs). Economic Outlook. Annual Report 2016: BBVA. Bell, L. (2008). Addressing the challenges of commercializing new thermoelectric materials. Paper presented at the International conference on thermoelectrics, Oregon, USA. Blackman, C., Hallstrom, O., & Bales, C. (2014). Demonstration of Solar Heating and Cooling System using Sorption Integrated Solar Thermal Collectors. Paper presented at the EuroSun, Aix-les-Bains, France. Blismas, N., Pendlebury, M., Gibb, A., & Pasquire, C. (2005). Constraints to the use of off-site production on construction projects. Architectural Engineering and Design Management, 1(3), 153-162. Bluyssen, P. M. (2009). The Indoor Environment Handbook: How to Make Buildings Healthy and Comfortable: Earthscan LLC. Bonato, P., D'Antoni, M., & Fedrizzi, R. (2016). Integration of a sorption collector coupled with a decentralized mechanical ventilation unit in curtain wall module. Paper presented at the Advance Building Skins, Bern, Switzerland. Bong, T., Ng, K., & Tay, A. (1987). Performance study of a solar-powered air-conditioning system. Solar Energy, 39(3), 173-182. BP. (2016). BP Energy Outlook, 2016 edition. London, United Kingdom. Broad. (n.d.). BROAD Group. Retrieved April 6th, 2018, from http://en.broad.com/. Brown, D. R., Fernandez, N., Dirks, J. A., & Stout, T. B. (2010). The Prospects of Alternatives to Vapor Compression Technology for Space Cooling and Food Refrigeration Applications. USA: Pacific Northwest National Laboratory (PNNL). Prepared for the U.S. DOE under contract DE-AC05-76RL01830. Buyadgie, D., Nichenko, S., & Schenyh, V. (2010). Solar Ejector Refrigerating And Air-Conditioning System (SERAS) Working on Zeotropic Mixtures. International Refrigeration and Air-Conditioning Conference. Carrier. (n.d.). Carrier. Retrieved April 6th, 2018, from https://www.carrier.com. Chaiwiwatworakul, P., Matuampunwong, D., & Chirarattananon, S. (2012). Energy Saving Potential from daylighting through External Multiple-Slat Shaded Window in the Tropics. International Journal of Renewable Energy Research, 2(3). CIBSE. (2012). Guide F: Energy Efficiency in Buildings. UK: CIBSE. CICA. (2002). Industry as a partner for sustainable development-Refrigeration: Confederation of International Contractors' Associations. ClimaSol. (2002). ClimaSol - Promoting Solar Air Conditioning: Technical overview of active techniques. ALTENER Project Number 4.1030/Z/02-121/2002. Compagno, A. (2002). Intelligent Glass Facade: Birkhauser. Daniels, K. (2003). Advanced Building Systems: A Technical Guide for Architects and Engineers: Birkhäuser. De Boer, R., Smeding, S. F., & Mola, S. (2009). Silicagel-water adsorption cooling prototype system for mobile air conditioning. Paper presented at the Heat Powered Cycles Conference '09. 7-9 September 2009., Berlin. DehuTech. (n.d.). DehuTech AB. Retrieved April 6th, 2018, from http://dehutech.com/. DOE/EIA. (2016). International Energy Outlook 2016. Washington, DC, USA: US Energy Information Administration, US Department of Energy. Ebbert, T. (2010). Re-Face: Refurbishment Strategies for the Technical Improvement of Office Façades. (PhD), Delft University of Technology, Delft, The Netherlands. ECOHEATCOOL. (2006). The European cold market, final report. Ecoheatcool and Euroheat & Power 2005-2006. Brussels. : Euroheat & Power. Egan, J. (1998). Rethinking Construction: The Report of the Construction Task Force to the Deputy Prime Minister. London. EIA. (2015). EU F-Gas Regulation Handbook: Keeping ahead of the curve as Europe phases down HFCs. London, UK: Environmental Investigation Agency. European Commission. DIRECTIVE 2002/91/EC: EUR-Lex (2002). European Commission. DIRECTIVE 2010/31/EU: Energy Performance of Buildings - Recast (2010) (2010). Escarré, J., Li, H.-Y., Sansonnens, L., Galliano, F., Cattaneo, G., Heinstein, P., . . . Perret-Aebi, L.-E. (2015). When PV modules are becoming real building elements: White solar module, a revolution for BIPV. Paper presented at the Photovoltaic Specialist Conference (PVSC), 2015 IEEE 42nd, New Orleans, LA. Fahrenheit. (n.d.). FAHRENHEIT. Retrieved April 6th, 2018, from https://fahrenheit.cool/. Farkas, K., & Horvat, M. (2012). 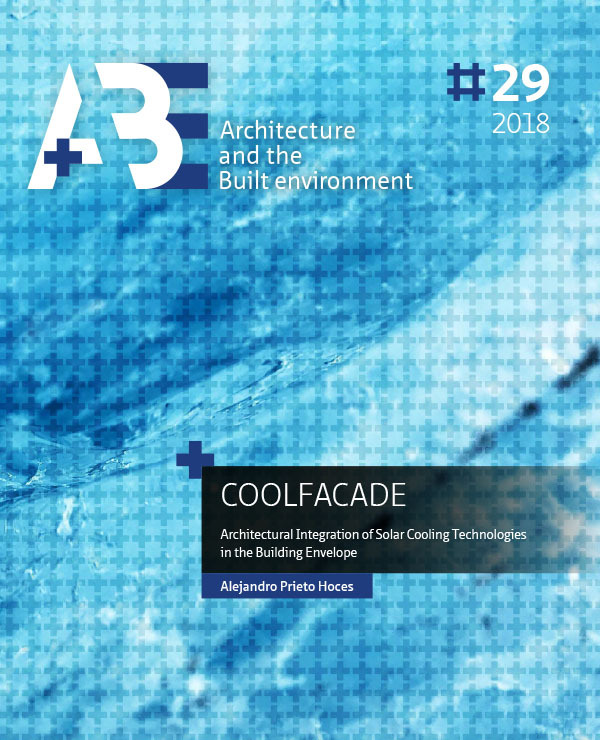 T.41.A.1: Building integration of Solar Thermal and Photovoltaics - Barriers, Needs and Strategies: IEA SHC Task 41: Solar Energy and Architecture. Fischer, S., Tomlinson, P., & Hughes, P. (1994). Energy and global warming impacts of not-in-kind and next generation CFC and HCFC alternatives: ORNL. Franzke, U., Heidenreich, R., Ehle, A., & Ziller, F. (2003). Comparison between decentralised and centralised air conditioning systems. Dresden, Germany: ILK Dresden. Frontini, F. (2011). Daylight and solar control in building: A new angle selective see-thorough PV-façade for solar control. Paper presented at the PLEA 2011 - Architecture and Sustainable Development, Conference Proceedings of the 27th International Conference on Passive and Low Energy Architecture. Gasparella, A., Cappelletti, F., Pernigotto, G., & Romagnonj, P. (2012). Long-term evaluation of internal thermal comfort with different kinds of glazing systems and window sizes: From energetic considerations to users' comfort. Paper presented at the ASHRAE Transactions. Gea. (2012). Global Energy Assessment - Toward a Sustainable Future. Cambridge University Press, Cambridge, UK and New York, NY, USA and the International Institute for Applied Systems Analysis, Laxenburg, Austria. Geetha, N. B., & Velraj, R. (2012). Passive cooling methods for energy efficient buildings with and without thermal energy storage – A review. Energy Education Science and Technology Part A: Energy Science and Research, 29(2), 913-946. Geros, V. S., M; Tsangrasoulis, A; Guarracino, G. (1999). Experimental evaluation of night ventilation phenomena. Energy and Buildings, 29, 141-154. Gibson, M. (2008). The Active Thermal Manifold Skin: Feasibility, Prototyping, and Performance Studies of a Wall System Integrating Distributed Solid State, Solar Powered Cooling and Heating Technology. Collegue of Architecture and Planning, Ball State University. Muncie, IN, USA. Givoni, B. (1994). Passive Low Energy Cooling of Buildings: Wiley. Goetzler, W., Zogg, R., Young, J., & Johnson, C. (2014). Energy savings potential and RD&D opportunities for non-vapor-compression HVAC technologies. USA: U.S. Department of Energy, Office of Energy Efficiency and Renewable Energy, Building Technologies Office. Gratia, E., & De Herde, A. (2004b). Optimal operation of a south double-skin facade. Energy and Buildings, 36(1), 41-60. Gratia, E., & De Herde, A. (2007a). Greenhouse effect in double-skin facade. Energy and Buildings, 39(2), 199-211. Gratia, E., & De Herde, A. (2007b). Guidelines for improving natural daytime ventilation in an office building with a double-skin facade. Solar Energy, 81(4), 435-448. Haase, M., & Amato, A. (2006). Ventilated façade design in hot and humid climate. Paper presented at the PLEA 2006 - 23rd International Conference on Passive and Low Energy Architecture, Conference Proceedings. Haase, M., Andresen, I., & Helge Dokka, T. (2009). The role of advanced integrated facades in the design of sustainable buildings. Journal of Green Buildings, 4(1), 76-98. Hellmann, H.-M., & Grossman, G. (1995). Simulation and analysis of an open-cycle dehumidifier-evaporator-regenerator (DER) absorption chiller for low-grade heat utilization. International Journal of Refrigeration, 18(3), 177-189. Henning, H.-M., Erpenbeck, T., Hindenburg, C., & Santamaria, I. S. (2001). The potential of solar energy use in desiccant cooling cycles. International Journal of Refrigeration, 24, 220-229. Herzog, T., Krippner, R., & Lang, W. (2004). Facade Construction Manual: Birkhauser. Hitachi. (n.d.). Hitachi Group. Retrieved April 6th, 2018, from http://www.hitachi.com/. Huang, B. J. C., J.M. ; Petrenko, V.A. ; Zhuk, K.B. (1998). A solar ejector cooling system using refrigerant R141b. Solar Energy, 64(4-6), 223-226. Huang, K. T., & Lin, H. T. (2007). Development of simplified estimation method of chiller energy use for office buildings in Taiwan. Paper presented at the ASHRAE Transactions. Ibáñez-Puy, M., Sacristán-Fernández, J. A., & Martín-Gómez, C. (2013). Construction of an Active Facade Envelope with Peltier Cells. Paper presented at the 39th World Congress on Housing Science - Changing Needs, Adaptive Buildings, Smart Cities, Milan, Italy. InvenSor. (n.d.). InvenSor. Retrieved April 6th, 2018, from http://invensor.com/. IPCC/TEAP. (2005). Special Report: Safeguarding the Ozone Layer and the Global Climate System. Jaehnig, D. (2009). D-A1: Market available components for systems for Solar Heating and Cooling with a Cooling Capacity <20 kW / A technical report of subtask A of IEA SHC Task 38: Solar Air-Conditioning and Refrigeration. Austria: AEE Intec. Jakob, U., & Mittelbach, W. (2008). Development and investigation of a compact silica gel/water adsorption chiller integrated in solar cooling systems. Paper presented at the VII Minsk International Seminar “Heat Pipes, Heat Pumps, Refrigerators, Power Sources”, Minsk, Belarus. Jochem, E., & Schade, W. (2009). 2-degree scenario for Europe - policies and impacts. ADAM: Adaptation and mitigation strategies: supporting European climate policy. Karlsruhe, Germany: Fraunhofer Institute for Systems and Innovation Research (Fraunhofer-ISI). Kalogirou, S. A. (2013). Solar Energy Engineering: Processes and Systems: Elsevier Science. Kalz, D., & Pfafferott, J. (2014). Thermal Comfort and Energy-Efficient Cooling of Nonresidential Buildings: Springer International Publishing. Kathabar. (n.d.). Alfa Laval Kathabar. Retrieved April 6th, 2018, from http://www.kathabar.com/. KeepCool. (2005). Service buildings KeepCool: Promotion of sustainable cooling in the service building sector. Final Report. In F. Unterpertinger (Ed.). Vienna, Austria: Austrian Energy Agency. Klein, T. (2013). Integral Facade Construction: Towards a new product architecture for curtain walls: TU Delft. Knaack, U., Klein, T., Bilow, M., & Auer, T. (2007). Facades: Principles of Construction: Birkhauser Verlag GmbH. Kohlenbach, P., & Jakob, U. (2014). Solar Cooling: The Earthscan Expert Guide to Solar Cooling Systems: Taylor & Francis. Kozubal, E., Woods, J., Burch, J., Boranian, A., & Merrigan, T. (2011). Desiccant enhanced evaporative air-conditioning (DEVap): evaluation of a new concept in ultra efficient air conditioning. Colorado, US: National Renewable Energy Laboratory (NREL). Kuhn, T. E. (2013). Cost-Effective - Deliverable D0.1.4: Final summary report. Lechner, N. (2014). Heating, Cooling, Lighting: Sustainable Design Methods for Architects: Wiley. Ledbetter, S. (2001). Barriers to the integration of cladding and building services. Paper presented at the 22nd Annual AIVC Conference, Bath, UK. Lee, E., Selkowitz, S., Bazjanac, V., Inkarojrit, V., & Kohler, C. (2002). High Performance Commercial Building Facades. Berkeley, USA: LBNL, University of California. Li, D. H. W., Lam, T. N. T., Chan, W. W. H., & Mak, A. H. L. (2009). Energy and cost analysis of semi-transparent photovoltaic in office buildings. Applied Energy, 86(5), 722-729. Lof, G. O. G. (1955). Cooling with solar energy. Paper presented at the Congress on Solar Energy, Tucson, Arizona, USA. Loncour, X., Deneyer, A., Blasco, M., Flamant, G., & Wouters, P. (2004). Ventilated Double Facades. Classification & illustration of facade concepts. Belgium: Belgian Building Research Institute (BBRI). Lowenstein, A., Slayzak, S., & Kozubal, E. (2006). A zero carryover liquid-desiccant air conditioner for solar applications. Paper presented at the ISEC2006 ASME International Solar Energy Conference, Denver, CO, USA. Mach, T., Grobbauer, M., Streicher, W., & Müller, M. J. (2015). MPPF - The multifunctional plug & play approach in facade technology: Verlag d. Technischen Universität Graz. Mahler, B., & Himmler, R. (2008). Results of the evaluation study DeAL - Decentralized facade integrated ventilation systems. Paper presented at the 8th International Conference for Enhanced Building Operations, Berlin, Germany. Mayring, P. (2014). Qualitative content analysis. Theoretical foundation, basic procedures and software solution. Klagenfurt, Austria. Melendo, J. M. A., & La Roche, P. (2008). Effects of window size in daylighting and energy performance in buildings. Paper presented at the American Solar Energy Society - SOLAR 2008, Including Proc. of 37th ASES Annual Conf., 33rd National Passive Solar Conf., 3rd Renewable Energy Policy and Marketing Conf. : Catch the Clean Energy Wave. MultiChill. (n.d.). MultiChill Technologies Inc. Retrieved April 7th, 2018, from http://multichilltech.com/. Munari-Probst, M. C., Roecker, C., & Schueler, A. (2005). Architectural integration of solar thermal collectors: results of a european survey. Paper presented at the ISES Solar World Congress, Orlando, USA. Munari-Probst, M. C., & Roecker, C. e. (2012). Solar energy systems in architecture. Report T.41.A.2 IEA SHC Task 41 Solar energy and Architecture. Munters. (n.d.-a). DesiCool air conditioning - product brochure. Retrieved March 15th, 2018, from https://www.munters.com/. Munters. (n.d.-b). Munters. Retrieved April 6th, 2018, from https://www.munters.com/. Nakahara, N., Miyakawa, Y., & Yamamoto, M. (1977). Experimental study on house cooling and heating with solar energy using flat plate collector. Solar Energy, 19, 657-662. Nicol, F., Humphreys, M., & Roaf, S. (2012). Adaptive Thermal Comfort: Principles and Practice: Taylor & Francis. NIOSH. (n.d.). The National Institute for Occupational Safety and Health (NIOSH). Retrieved November 16th 2017, from https://www.cdc.gov/niosh/index.htm. NREL. (n.d.-a). EnergyPlus. Retrieved September 16th, 2016, from https://energyplus.net/. NREL. (n.d.-b). System advisor model (SAM). Retrieved January 24th, 2018, from https://sam.nrel.gov/. PRIETO HOCES, Alejandro. COOLFACADE. A+BE | Architecture and the Built Environment, [S.l. ], n. 29, p. 302, nov. 2018. ISSN 2214-7233. Available at: <https://journals.open.tudelft.nl/index.php/abe/article/view/2775>. Date accessed: 20 apr. 2019. doi: https://doi.org/10.7480/abe.2018.29.2775.